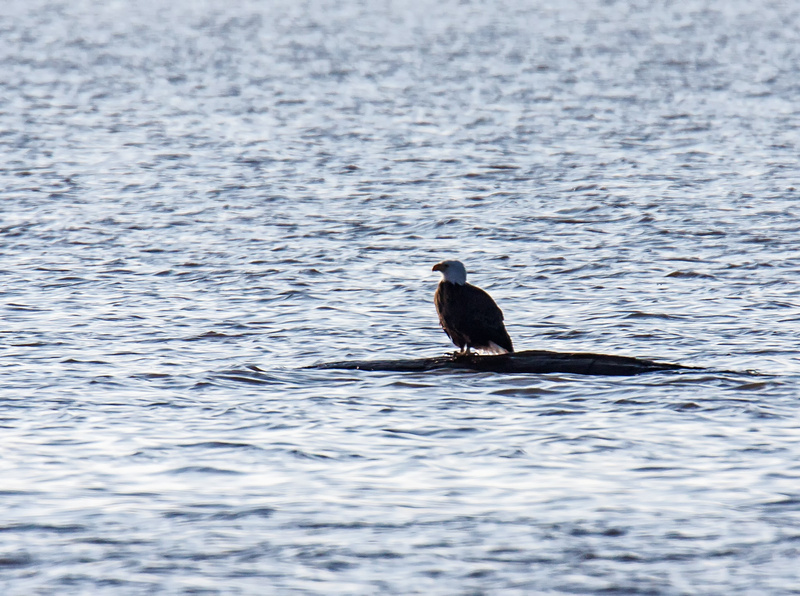 When I first spotted this bird perched on a distant piece of floating driftwood, I assumed that it was a cormorant. The more I looked at it, though, the more I thought that the body proportions were wrong for a cormorant. I was a bit shocked when I zoomed in and discovered that it was a Bald Eagle (Haliaeetus leucocephalus). Why was the eagle perched like this? Was it looking for a moment of solitude? Somehow the solitary eagle reminded me of a shipwrecked sailor, adrift in the vast expanses of the ocean. Well, wonders never cease! Being from NZ I know little about your Bald Eagles but even so I’d never have expected to see a photo of this bird in an extremely watery situation like this! I’m amazed! And good on you for being so observant!